A very special wish to you for a peace-filled Easter. I am away as usual to lead the Easter Retreat at beautiful Mana Retreat Centre in New Zealand (and will see some of you there). This is such a deep time for many, and often an opportunity for a renewal of hope and energy. With that in mind, I’d like to share with you a very short article/review I have posted on my website (you can also read it there, with pictures/images). Do enjoy it. I’m sharing quite a challenging idea from Thomas Merton, and briefly reflecting on a most uplifting book by Richard Rohr: both writers with an unconditionally inclusive view of our vast human family and our shared inner needs. I’m also wondering if, like me, you have been thinking wistfully about simplicity as life gets ever more hectic. Even the idea of it seems daunting to many people. Or like a mirage. On my website front page you can find the YouTube link to the most recent talk I gave at the monthly services. It’s on the theme of “Gaining simplicity”, including giving up whatever perfectionism gets in the way of ease of mind. The quality of the filming isn’t great, but the sound quality is fine. And that’s what matters most. I am always delighted to hear if these talks are supportive for you. Isn’t it the most amazing thing that we can share thoughts and experiences in so many ways? You will also find regular inspirations on Facebook. It’s a public page so you don’t need to commit to FB to enjoy them. A quick reminder, too, that the next Sydney service is (3rd Sunday of the month): 15 April 2012: Pitt Street (264) Uniting Church, Sydney. 3pm. Glorious music, uplifting teachings. All welcome. Desiring, seeking: this means giving time as well as attention to what matters most to you. It means aligning values with purpose and allowing yourself to be your own full self in whatever situation you find yourself. It means opening to the highest inspiration and the most spacious, inclusive ideas. It means caring very much how your choices and behaviour affect others, but with less fear of superficial judgements. It means feeling at home in your own life: trusting the guidance of the “small still voice within” that only wants good for you. It means trusting that you are capable of learning from your own experiences. And being fully aware that every new day – like every life – truly matters. I am loving reading Richard Rohr’s new book, Falling Upward: A spirituality for the two halves of life. It invites us into a spiritual maturity that will never be dependent on chronological age but rather on courage and a willingness to discover, as we live it, What is life for? There’s so much to treasure here, including the desire to participate rather than assert – and with a growing sense of infinity and spaciousness that’s gloriously counter-intuitive to any sense of “life running out”. His book finishes with a meditation on a poem by fellow-priest and inclusive thinker, Thomas Merton. 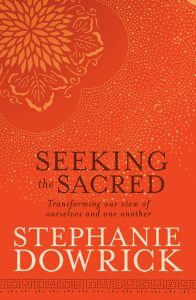 Falling Upward is essentially a meditation on contemporary spiritual life – and living it in the real world – that sets the scene in the inclusive, wisdom-seeking way that I hope my own Seeking the Sacred also does. Of course Rohr’s book reflects his experiences, and my book reflects my very different life, but this is also an invitation to live each sacred moment to the full. It beautifully points us towards deepened purpose, joy and gratitude, with energy to spare for times of sorrow. I feel sure that Thomas Merton would have welcomed it; so can we.